Location: Pass Pemberton PetroCanada. 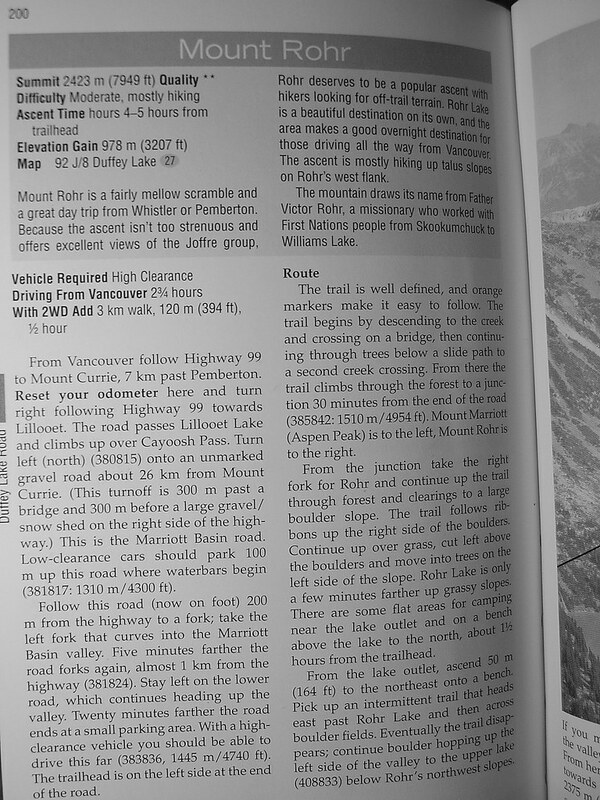 Drive east to Mount Currie then turn right onto Highway 99 for Lillooet. 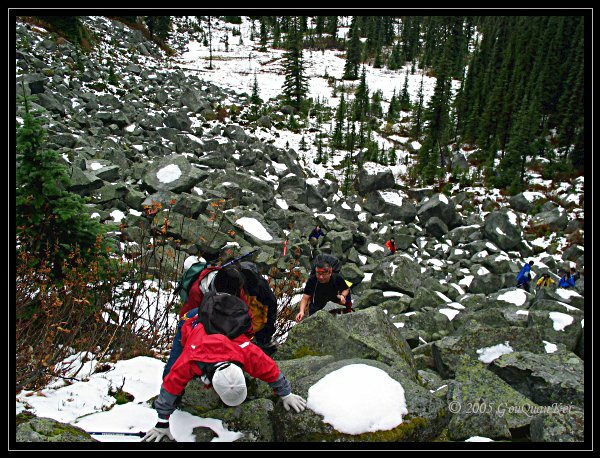 Cross the Lillooet River then start to ascend towards Cayoosh Pass and Duffey Lake. Pass the Cayoosh Creek bridge then turn left onto Cayoosh Creek Forest Service Road (FSR). 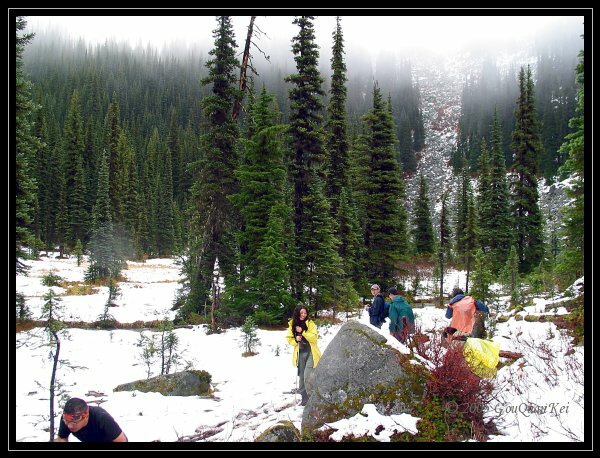 For a high clearance 4WD vehicle, it may be able to reach the trail head (staying left at two forks). Combining the day hiking and backpacking to suit for individual’s need was a very creative idea. Point B was the fork of the Forest Service Road. Point C was where the 4WD were parked. It was a bit difficult to drive further in. 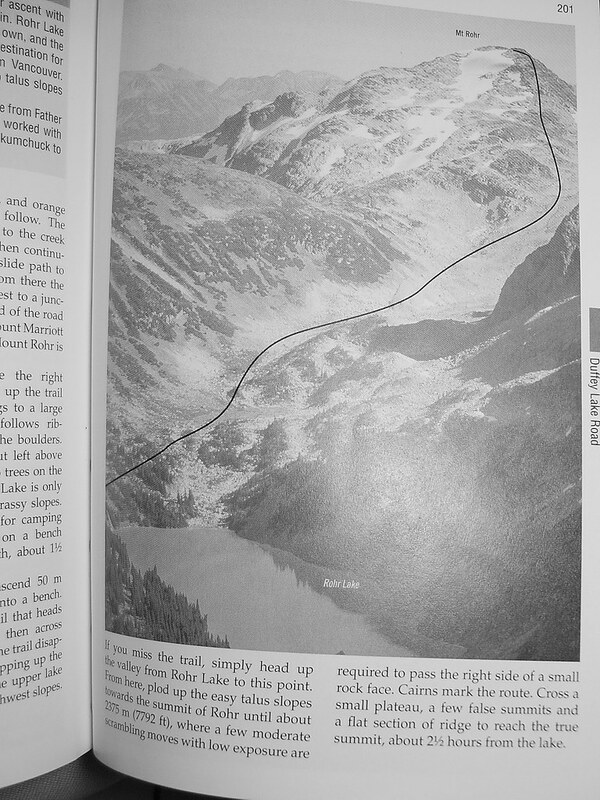 Point D was the junction to Rohr Lake and Marriott Meadow. Point E was the top of the boulders field. Point F was where we met the other campers. Blue color track marked the way up and the yellow color track marked our way down. From trail head to the lake and then back to the junction was about 6.3km (elevation gain 1,620 ft). From the junction to the lake was about 1.80km (elevation gain was 1,141 ft.) Was it challenging? No comment. 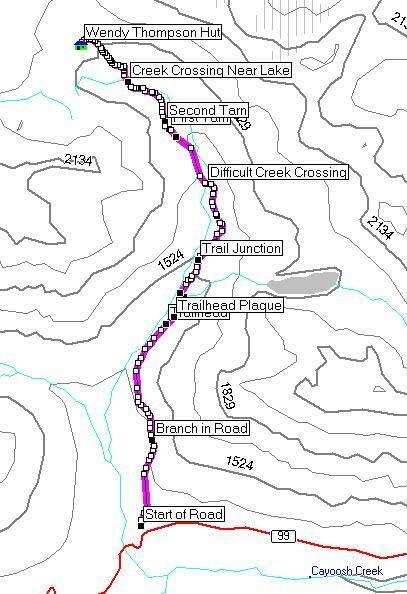 The yellow color track showed how backpacking group continued their hike from the junction to the hut. Point A was where the group had to walk over a fallen log to cross a fast flowing creek. When we reached the meadow it was about 6:15pm. The last 2km was walking in the twilight. Everyone was grumbling. From trailhead to the hut was about 10km. Compared with day hiking group, we climbed one more mountain.